Between the spring of 1824 and July 1827, the month before he died, William Blake regularly visited John Linnell and his family at their cottage, Collins Farm, in Hampstead, missing the visits only when ill, which was an increasing problem during his last year.1↤ 1 Linnell moved his family to Hampstead on 6 March 1824; Blake’s first recorded visit is 18 May 1824. A. H. Palmer said that his father Samuel and Blake “often walked up to the village together” (Bentley, Blake Records 286, 292; hereafter cited as BR). On Tuesday, 3 July 1827, Blake thanked Linnell “for the Ten Pounds” he had just sent and informed him that his “journey to Hampstead on Sunday brought on a relapse which is lasted till now. I find I am not so well as I thought I must not go on in a youthful Style—however I am upon the mending hand to day & hope soon to look as I did for I have been yellow accompanied by all the old Symptoms.”2↤ 2 Erdman, David V., ed. The Complete Poetry and Prose of William Blake (New York: Doubleday, 1988) 785. Hereafter cited as E. This news would not have surprised Linnell; he knew that Blake often blamed the Hampstead air for bringing about his “old Symptoms,” which included fever and stomach pains (BR 306; E 775). And, no doubt, since Blake’s health was the subject of 17 of his 19 extant personal letters to Linnell over the last 29 months (Keynes 156-70), Linnell was accustomed to Blake’s optimistic and reassuring diagnoses. But Linnell must have suspected the worst.3↤ 3 In addition to these 19 letters and notices, Blake wrote in his last two years two short notes to Mrs. Linnell, one to Maria Denman, another to Mrs. Aders excusing himself from one of her salons due to illness, and a long letter to Cumberland (E 774, 776, 781, 783). The only full-length study of Blake’s letters, by David Wells, virtually ignores the last letters, spending only three paragraphs on them (120-21). Based on extant letters, Blake’s epistolary efforts during his last years were slight compared to those exerted during the period of 1800 to 1805, which includes 54 letters, but they were more extensive than those for the periods of 1791 to 1799 and 1806 to 1819, which includes only six and nine letters respectively (excluding receipts to Butts and including two letters to magazines). Letters from 1800 to 1805 reveal a Blake either “Emit[ting] sparks of fire” (E 709) or entering “a Deep pit of Melancholy, Melancholy without any real reason for it, a disease which God keep you from and all good men” (2 July 1800, E 706). Blake was aware of depression’s effect on his work and wife, and, though puzzled over its cause, always prescribed work as the antidote (E 706, 719-20, 724, 756, 767). From these letters comes the speculation that Blake’s artistic and spiritual crises were forms of depression, filled with anxiety and self-doubt (Wells 82-85, Jamison 92-95). Indeed, from the summer of 1818, when the two artists met, to early 1825, there is no record of personal letters, only business transactions, because they met regularly, going to exhibitions, galleries, plays, and various social gatherings (BR 256-310). The letters were occasioned by Blake’s illness, and when read together they reveal a pattern of illness waxing and waning and a man more anxious about his work being disrupted than his life ending. Linnell had already expressed serious concern about Blake’s health by the summer of 1826, when he had hoped to move Blake to Hampstead so that he would be nearby (BR 338; Gilchrist 1: 350), and he did so again on 7 February 1827, when he encouraged Blake to live at Cirencester Place (BR 338), an idea that Blake refused after much anxious reflection (E 782).4↤ 4 Linnell wrote in his journal: “February 7. To Mr Blake to speak to him @ living at C[irencester] P[lace].” But Cirencester Place was the name of a street near Fitzroy Square, where Blake’s brother James lived and where Linnell had his London studio/residence. As Bentley explains, the “reference does not make clear whether the Blakes were to move into Linnell’s studio, into independent lodgings, or into the building where Blake’s brother James lived” (BR 338 and n3). Given that Linnell’s objective appears to have been to keep a closer eye on Blake, it seems reasonable to assume that he hoped to move Blake closer to him and other of his friends in that neighborhood, which included Flaxman and Thomas Butts. Now, with this new letter of 3 July 1827, despite Blake’s optimism and good cheer, Linnell must have been alarmed, for the “old Symptoms” were accompanied by something new and frightening: the yellowing of Blake’s skin. We would like to thank Aileen Ward, Morton Paley, and G. E. Bentley Jr. for reading earlier versions of this paper and for their helpful suggestions. begin page 37 | ↑ back to top specific description of the cause might be liver failure due to biliary cirrhosis. Cirrhosis is an irreversible alteration of the liver architecture consisting of hepatic fibrosis and areas of nodular regeneration (Wyngaarden, Smith, and Bennett 786). A variety of disease processes can lead to cirrhosis. When it develops due to obstruction in the biliary system, it is called biliary cirrhosis. A review of the available information on Blake’s illness and a close reading of Blake’s and his contemporaries’ descriptions of his illness suggests that among the currently recognized causes of biliary cirrhosis the most likely is sclerosing cholangitis. Sclerosing cholangitis occurs most commonly in individuals with inflammatory bowel disease (IBD), a chronic diarrheal disease (Sherlock 249, Shorter 311). Alexander Gilchrist, Blake’s first biographer, states that Blake “was a perpetual sufferer from intermittent attacks of cold and dysentery” (1: 347). The modern interpretation of a “cold” is an upper respiratory infection, “an inflammatory condition of the mucous membranes of the respiratory organs, accompanied by catarrh, hoarseness, and cough” (OED). In the eighteenth century, however, the term was more flexible, referring also to “an indisposition of the body caused by exposure to cold” (OED). Blake appears to have used the term in both these senses. In a letter sent on 30 January 1803 from Felpham to his brother James, Blake says: “I have no Ague but have had a Cold this Winter”; he also claimed that “the air tho warm is unhealthy” and acknowledged that “I was really very ill when I wrote [Butts] the last time” (i.e., 10 January 1803). When he returned to London, he wrote Hayley of his “violent cold which confind me to my bed 3 days & to my chamber a week” (E 725-26, 740). But in a letter to John Linnell on 1 February 1826, Blake referred to a “cold in my stomach” (E 775), indicating a gastrointestinal illness. Gastrointestinal “colds” and dysentery are consistent with the speculation that Blake had IBD, a chronic (Gilchrist’s “perpetual”) diarrheal disease characterized by exacerbations and remissions (Gilchrist’s “intermittent”). Unfortunately, with only nine known letters between 1 July 1806 and March 1825 (and only four or five of these could be called personal), the documentary evidence necessary to trace a pattern in his health during these years is absent. However, to Henry Crabb Robinson, apparently on their first visit at the Aders on 10 December 1825, Blake spoke of “a bowel complaint which nearly killed him.” The cause, according to Blake, was Wordsworth’s “preface to the Excursion” (BR 325).5↤ 5 In his diary, Robinson records Blake as saying that “he had been much pained by readg the introduction to the excursion It brought on a fit of illness” (BR 312); in his Reminiscences, he states that “The Preface to the Excursion especially the Verses quoted from book I. of the Recluse, so troubled him as to bring on a fit of illness” (BR 545); but to Dorothy Wordsworth he identified the illness as a “bowel complaint.” The offending passage expressed the idea of passing Jehovah “unalarmed.” When Blake read the Excursion, published in 1814, is not known, but Flaxman had been similarly offended by the same passage, as he told Robinson on 19 December 1814. As Bentley surmises, “it would not be surprising if Flaxman and Blake had talked about the offensive passage” (BR 312n3). If so, then Blake’s IBD may have been present this early. Blake himself, though, seems to admit that his stomach colds were present even earlier, while he was “young,” and that they had been precipitated not by literature but by all points north of London. In his 1 February 1826 letter, he tells Linnell: ↤ 6 In response to Mrs. Linnell’s statement that Hampstead was a healthy place, Blake asserted: “It is a lie! It is no such thing” (BR 306). Perhaps Gilchrist had this response and letter in mind when he said that Blake “cherished a wilful dislike to Hampstead, and to all the northern suburbs of London” (1: 353). The subject of Blake’s compass symbolism is too complex to pursue here, but note that Urizen was banished to the north by the eternals and that Blake describes bowels negatively (“To Klopstock”) and positively. Bowlahoola, in Milton, puns on bowels and corresponds to stomach, heart, and lungs; as it houses Los and the imagination, it is the positive side to the fourth stage of humanity, which is Or-Ulro, situated in “the Stomach and Intestines, terrible, deadly, unutterable” (E 134) Further study of Blake’s health may provide surer grounds for such biological and anatomical passages. What the 68 year-old Blake means by “young” is uncertain, but a reasonable guess would be his twenties and thirties, that is, in the 1780s and 1790s. This would be consistent begin page 38 | ↑ back to top with Tatham’s statement that Blake “and his Wife” went on very long walks “in his youth” (BR 527). Blake’s walks to villages north of London may have continued to at least 1808, when Thomas Butts appears to have moved from a house in Dalston to Fitzroy Square (Viscomi “Green House” 12). When signs of IBD first began to reveal themselves is not known, but they appear to have been chronic or “perpetual,” as Gilchrist says. If Blake suffered from IBD in his “youth,” then it was probably still present at the end of his life, which would be consistent with Blake’s behavior, for, while he regularly speaks of his health improving and of his ability to continue working, he also says he dare not leave the house. That it was intermittent is evinced by Linnell’s journal, which records his and Blake’s going to Lahee’s, the City, and an exhibition in March, April, and May 1825 (BR 301). If Blake had IBD complicated by sclerosing cholangitis, the final stages of his illness began about 29 months before his death, as indicated by Blake’s undated letter to Linnell, which appears to have been written in early March 1825, making it the first extant personal letter to Linnell: ↤ 7 This letter was written on “12 O Clock Wednesday,” which may have been 2 March 1825. The letter informs Linnell that Blake will try but may miss the appointment with Lahee, the printer of the Illustrations of the Book of Job. Linnell records a meeting with Lahee and Blake for Saturday 5 March 1825 (BR 300), which suggests that Blake’s letter was written 2 March and the meeting was put off for two more days due to Blake’s illness. Erdman dates the letter “March” (773) while Keynes merely places it before the next letter, dated 7 June 1825 (156). Both editors, though, consider it the first known letter to Linnell. It is also Blake’s first extant letter since 11 October 1819; all correspondence between these dates consists of receipts and the contract with Linnell for Job. The unaddressed letter of 11 October 1819 may have been to Linnell, as Erdman and Keynes speculate, but this seems unlikely, given its tone and a provenance in which Linnell or Samuel Palmer (Linnell’s son-in-law) do not figure (there is only one Linnell document of 32 that fits this description; see Keynes 225 #173). In October of 1819, Blake was frequently seeing John Varley, of Visionary Heads fame (BR 259), and in the letter he mentions meeting up with the engraver and watercolorist Thomas Heaphy, who in 1807 became a member of the Old Watercolor Society, of which Varley was a founding member. The two men must have known one another, whereas there is no evidence that Heaphy and Linnell were friends. Whoever the recipient, though, the letter is of interest regarding Blake’s health, for Blake ends it with: “hoping that I may meet you again in perfect Health & Happiness.” Is Blake alluding to his health or that of the addressee? A shivering fit is the nineteenth-century description of fever and chills (Elliotson 140), symptoms that can occur in individuals with IBD and particularly in those with sclerosing cholangitis (Wyndgaarden, Smith, and Bennett 701, Schiff 1312). Chills and fever develop in about fifty percent of individuals with sclerosing cholangitis (Schiff 1312). That the “old” symptoms “returned” suggests that Blake experienced similar problems for some time, reconfirming the chronic and intermittent nature of the illness. In his second letter to Linnell, Blake described his problem as “ague.” On 7 June 1825, he wrote that ↤ 8 The 102 Dante drawings, in varying degrees of completion, and the seven unfinished engravings figure prominently in Blake’s last letters, between March 1825 and July 1827. They apparently overlapped with other work, like late temperas, watercolors, the Laocoön engraving, the unfinished Pilgrim’s Progress drawings, and reprintings of the Songs (copies U, X, Y, W, Z, AA), Marriage (copy I), and Jerusalem (copy F) (see Butlin 1: 481, 775-77, 798-802, 805-07, 811, 812.1-102, 813-26, 827.1-5, 828.1-11, 829.1-29, 830-34; Essick and Viscomi 240-43; Viscomi, Blake chap. 35). The 102 drawings were not, in other words, completed in a forthnight in October of 1824, while Blake was in bed due to a scalded foot, as Palmer recalled many years later (BR 291). Indeed, if Blake had begun the Dante drawings that early, then they overlapped with the Job engravings. If so, perhaps this is another sign of Blake’s intermittent illness, which placed him in bed and prevented him from engraving the Job. Linnell did not begin paying for the Dante by name until 28 January 1825 (Keynes 152), but perhaps he had been paying for it “on acct” since 2 February 1824 (Keynes 148). In the nineteenth century, “ague” was a term used to describe a feverish illness with chills and sweating (Clutterbuck 756, Elliotson 140-41).9↤ 9 According to the OED, “ague” refers now “more usually to the cold or shivering stage” of a fever, but initially it referred to “the burning or feverish stage.” If Catherine Blake’s ague during the Felpham years is any evidence, this could be a debilitating condition; nevertheless, Blake characteristically refused to be disrupted and actually found work therapeutic.10↤ 10 Blake’s complaints about his and Catherine’s health seem genuine and not designed either to elicit sympathy from his brother James or justify to Hayley his leaving Felpham. Catherine was especially bothered there, suffering from “Agues & Rheumatisms” apparently during most of her stay and the fall of 1803 back in London (E 725, 738). Catherine remained sick through January 1804: “My poor wife has been near the Gates of Death” (E 740). Little wonder that Blake believed that “if sickness comes all is unpleasant,” and “only illness makes all uncomfortable & this we must prevent by every means in our power” (E 726-27). Blake sounds much as he did exactly one year earlier, when he first described his condition as a “return of the old Shivering Fit,” but now he compounds his description with the phrase “tottering state,” which reveals Blake’s awareness of himself as significantly weakening. 1 Etching the copper plate in a trough; detail. Encyclopedie, 1767. 2 Etching the copper plate diked in wax and feathering away gas bubbles; detail. Encyclopedie, 1751-52. A letter written three days later, on 5 July 1826, describes a remission: ↤ 12 By “Machine,” Blake seems ironically to mean his body, in the sense that “whatever enters . . . the Ulro” or material world, “Becomes Sexual, & is Created, and Vegetated, and Born . . . the Spectrous Uncircumcised Vegetation. / Forming a Sexual Machine: an Aged Virgin Form” (Jerusalem 44: 21-25, E 186-87). The illness, which appeared to be in remission for at least 11 days, left him weaker but hopeful. He writes on 14 July: “I am so much better that I have hopes of fulfilling my expectation & desire of Visiting Hampstead I am nevertheless very considerably weakend by the last severe attacks” (E 778). The relentless nature of his illness led Blake, though hopeful, to obtain new medical advice, but his letter from 16 July 1826 is the only mention of a specific therapy for his illness apart from diet, rest, and forcing sweats: ↤ 13 On 29 April 1826, Linnell sold a copy of the Job engravings to “Mr George Young, surgeon brother of [Charles Mayne] Young the actor” (BR 600). But George is probably not the Young of the letter, since he is a surgeon and the designation “Doctor” suggests a physician, as is still customary. The Young who treated Blake was probably Dr. James Forbes Young, a physician living in Lambeth, about 30 years old at the time of Blake’s death. He was also a licensed apothecary and an eminant botanist, which is consistent with a prescription of dandelion, as well as a print collector (Medical Times & Gazette 46). Fincham was probably Mr. George Fincham, a surgeon who worked at Bartholomew’s Hospital and later Westminister Hospital (The London and Provincial Medical Directory 134). In a postscript to his letter, Blake identifies him as a “Pupil of Abernathy’s,” which gave him “great pleasure” (E 780). John Abernathy was a prominent surgeon of the time at St. Bartholomew’s Hospital and wrote a variety of books on surgery. A report in the Lancet recommends copper sulphate for the treatment of dysentery (vol. 11, 524-25), which raises the possibility that Blake may have been treated with copper sulphate, since this treatment was current during the final years of his life. Dandelion is a folk remedy used to stimulate the liver or to treat gallstones. The medicinal use of dandelion suggests that a liver or biliary problem might have been diagnosed as the cause of Blake’s symptoms prior to the development of the jaundice. The development of hemorrhoids (piles) suggests that the sclerosing cholangitis has progressed to biliary cirrhosis.14↤ 14 One of the consequences of cirrhosis is obstruction to the flow of blood through the liver. This leads to increased pressure and enlargement of the veins that drain into the liver. Because the hemorrhoidal veins drain into the liver, hemorrhoids are common in cirrhosis (Wyngaarden 792). 3 Marriage plate 10 executed as an etching, 15.3 × 10.1 cm; the design cut through the ground with a needle. 333). The use of a cabriolet—a two-wheeled, one-horse carriage with two seats and a folding top—was certainly out of character, but apparently necessary because it could provide door-to-door delivery and perhaps a more comfortable ride than the “rumble” and bouncing of the larger stage he so feared. In light of these concerns and his condition, the speculation that Blake visited Edward Calvert in Brixton the following month (BR 333) ought to give pause—or did Blake make similar arrangements for transportation? Gilchrist comments that during the last year of his illness, Blake was “suffering from diarrhoea, or, perhaps, dysentery” (1: 353). As noted, Blake described himself as emaciated—“only bones and sinews All strings and bobbins like a Weavers Loom”—in his letter to Linnell on 1 August 1826, one year before he died. Emaciation is a feature of sclerosing cholangitis, and weight loss develops in up to seventy-nine percent of individuals with this disease (Sherlock 250). getting better every Morning but slowly. as I am still feeble & tottering. tho all the Symptoms of my complaint seem almost gone as the fine weather is very beneficial & comfortable to me I go on as I think improving my Engavings of Dante more & more & shall soon get Proofs. . . . In refusing to move nearer Linnell, Blake seems more anxious about his work than his health. He also seems to want to reassure Linnell. A few days later, he walked to Cirencester Place carrying four large Dante plates, ostensibly “to prevent the trouble of [Linnell’s] Coming thro Curiosity to see what I was about,” and stated that he was “getting better or [he] could not have Come at all” (E 782). The next letter, on 15 March, notes that he had received a letter from Cumberland, that Tatham senior paid him a visit, and that he was “getting on with the [Dante] Engravings,” but it does not mention his health (E 782). During these days, Blake “was frequently bolstered up in his bed” to work (Gilchrist 1: 359). But he must have had relatively long periods out of bed as well, since engraving the Dante plates required a table or workbench, as did Cumberland’s calling card, which he assured Cumberland he would “do as soon as Possible,” using his poor health as an excuse for the delay: “when you Consider that I have been reduced to a Skeleton from which I am slowly recovering you will I hope have Patience with me” (E 784). begin page 43 | ↑ back to top Ottley came through, commissioning copy F of Jerusalem, a monochrome copy for which he paid £5 5s.0d. Linnell records receiving this payment and giving the money to Mrs. Blake on 11 August (Keynes 149, BR 594)—one day before Blake died, and one day after Linnell had visited Blake and recorded in his journal that he was “Not expected to live” (BR 341). Apparently, Blake was either too weak or perhaps not awake to make the business transaction, as he normally did.15↤ 15 Linnell always insisted on payment before the delivery of goods, which in this case may have proved especially fortuitous, because £5 5s. combined with the £5 Mrs. Blake borrowed from Linnell on the day Blake died (BR 606) would have covered almost all of the £10 18s. cost of Blake’s funeral (BR 343). Linnell records giving Mrs. Blake this sum on 26 January 1828 for the funeral (BR 595), but it is not clear if he is reimbursing her or paying the bill over five months after services were rendered. There is no evidence that the bill was deferred by the undertaker, though that is certainly plausible, nor is it clear why Linnell would pay such a bill indirectly and thereby require Mrs. Blake to play messenger. Linnell retrieved Jerusalem copy F only partially numbered but clearly in Jerusalem’s “first order,” and he proceeded to order its 100 unbound leaves according to his copy (C), which was in the “second order.” Preparing the copy for Ottley required Linnell to erase and change some of Blake’s numbers as well as add those missing, thereby inadvertently altering Blake’s intentions (Viscomi, Blake chap. 34). There are no extant letters from Blake in May and June, and perhaps that is a good sign, pointing to the period in which he printed Jerusalem and finished Wainwright’s commissions. He did feel healthy enough to visit Hampstead at the end of June—the visit that Blake believed “brought on a relapse” and the jaundice that he described on 3 July 1827. Blake was bedridden during his last days. According to Tatham, “In August he gradually grew worse & required much more of his Wife’s attention, indeed he was decaying fast; his patience during his agonies of pain is described to have been exemplary” (BR 528). By 10 August, he was completely bedridden. According to Gilchrist, “his illness was not violent, but a gradual and gentle failure of physical powers, which no wise affected the mind. The speedy end was not foreseen by his friends.” When it came, on 12 August, Blake “lay chaunting Songs to Melodies, both the inspiration of the moment. . . . To the pious Songs followed, about six in the summer evening, a calm and painless withdrawal of breath; the exact moment almost unperceived by his wife, who sat by his side (Gilchrist 1: 360-61). The first obituary, published on 18 August 1827 in the Literary Gazette (and republished five times with minor variations; see BR 350n1), reported that Blake “died as he had lived, piously, cheerfully, talking calmly, and finally resigning himself to his eternal rest like an infant to its sleep” (BR 355).16↤ 16 Three days after Blake died, Richmond related a slightly different account of his last moments to Samuel Palmer: “Just before he died His countenance became fair—His eyes Brighten’d and He burst out in singing of the things he saw in Heaven” (Keynes 165). 4 Biting the facsimile etching of Marriage plate 10 in nitric acid and feathering away gas bubbles. Needless to say, these various accounts of Blake’s last days raise more questions than they answer. Was Blake’s final illness as nonviolent and its culmination as peaceful as Gilchrist and the obituary notice suggest, or was it, as Tatham states, accompanied with “agonies of pain,” with only the last hours peaceful, when his “spirit departed like the sighing of a gentle breeze” (BR 528)? Did he find the energy and inspiration one last time to compose and sing melodies just before dying? Tatham’s and Gilchrist’s descriptions are probably both correct, though they are of different stages of the illness. And both biographers are almost certainly incorrect about the deathbed scene. As noted, Linnell visited Blake two days before he died and knew that he was “Not expected to live.” From this journal entry and her belief that Blake died from a ruptured gallbladder (15), Ward infers that Blake was probably in a semi-comatose state (14). If correct—and we think it is, though not for the reasons Ward gives—that condition alone casts suspicion on the legend that Blake burst into song on his deathbed. In a provocative article examining the effect that stereotypes and archetypes of artists and heroes have had on Blake biographers (including Carlyle’s idea of the artist-as-hero on his disciple, Gilchrist), Ward argues that the legend is a version of the “myth of the death of the hero” (14). She traces its various forms—through Richmond, Smith, Cunningham, Tatham, and Gilchrist—to the same source, Catherine Blake, who, Ward argues, may have been the only witness, despite Richmond’s description of an unidentified person standing by (14 and n28). Ward is particularly suspicious of Tatham, as a person and biographer. At a full page, Tatham’s conflation of other deathbed accounts “pulled out all the stops,” with Blake coloring a print of the Ancient of Days, then sketching a portrait of Catherine, then singing hallelujahs and songs of joy “loudly & with true extatic energy” (BR 528), and then suggesting to Catherine that Tatham ought to manage her affairs, to which Ward responds: “This of a man begin page 44 | ↑ back to top dying of a ruptured gallbladder with attendant peritonitis!” (15). While her skepticism of Tatham’s account for medical reasons is justified, Ward’s unreferenced diagnosis is mistaken and actually contradicts her claim that Blake was semi-comatose during his last few days. After the gall bladder ruptures, the bacteria in the gall bladder spill out into the abdominal cavity and cause peritonitis (the inflammation[e] or infection of the membrane lining the walls of the abdominal cavity). Neither a ruptured gallbladder nor peritonitis accounts for the piles or the emaciation, but both would be very painful. Untreated, the patient develops septic shock, blood pressure falls, blood perfusion to the brain decreases, and unconsciousness (coma) intervenes for several hours, not days, prior to death. The swollen ankles and the disordered chest were likely due to fluid retention in the legs and lungs, respectively, a common terminal event which occurs in individuals with liver failure from any cause. The disordered chest suggests breathing difficulties likely due to pulmonary edema. Blake was 69 years old with old coronary arteries and old lungs (perhaps abnormal from the etching fumes), and he probably developed the pulmonary edema slowly over weeks or months, likely adjusting his activities and sleeping position to accommodate the fluid accumulating in his lungs. A semi-comatose state is consistent with this diagnosis, and it would likely have set in a day or two before Blake died, which is also consistent with Linnell’s comments on 10 August. If this were Blake’s condition, then it is unlikely that he awoke in his last hours with the energy to color, draw, sing, and talk. Far more likely, he entered “his eternal rest like an infant to its sleep,” and, while asleep, experienced “a calm and painless withdrawal of breath.” A believable scenario is that Blake went to sleep, his breathing slowed, an episode of apnea developed, and he never breathed again. Alternatively, Blake went to sleep, his breathing slowed, his blood oxygen level decreased, he experienced a heart attack, and he never woke up. 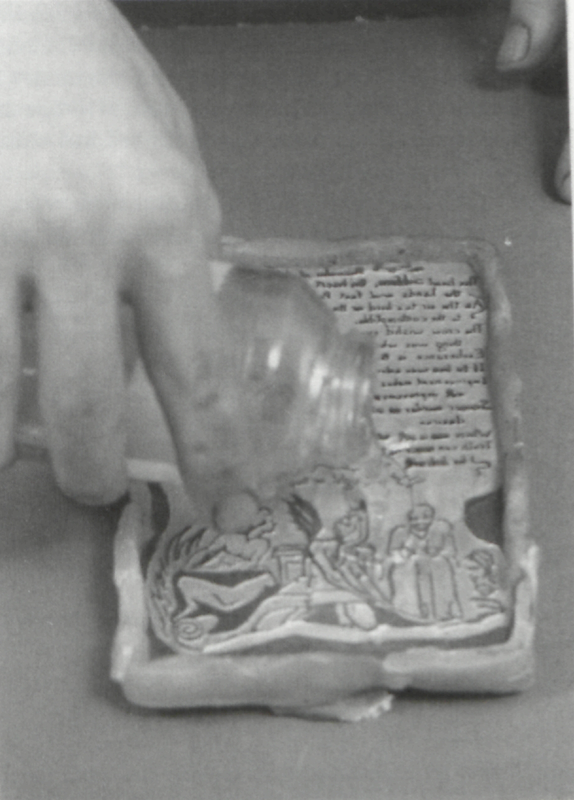 5 Facsimile of Marriage plate 10 as relief etching, 15.2 × 10 cm; pouring acid onto the diked plate. life, particularly the weeks and months leading to the final days. Blake’s “gnawing Pain in the Stomach” (19 May 1826), “paroxysms” (5 July 1826), “Species of Delireum,” and “Pain too much for Thought” (16 July 1826) are not what killed him; they are the “old Symptoms” he talks about six months before he died and which accompany IBD or sclerosing cholangitis, or both (see Table). Pulmonary edema was probably the final or absolute cause of death, but it resulted from liver failure due to biliary cirrhosis, itself probably caused by sclerosing cholangitis. But what caused the sclerosing cholangitis? 6 Facsimile of Marriage plate 10 as relief etching; feathering the plate in the nitric acid bath to remove gas bubbles; detail. As noted, by “youth” Tatham seems to refer to the same period Blake spoke of in 1826, when Blake recalled that “When [he] was young Hampstead Highgate Hornsea Muswell Hill & even Islington & all places North of London always laid me up the day after . . . [with] the same Complaint & the same torment of the Stomach.” All of these locales, though, are well within a 20-mile radius of Blake’s home. While it is apparent that he enjoyed long walks for most of his life, it seems unlikely that Blake, who boasted that he “never suspended his Labours on Copper for a single day” (E 568), would have ever made a “habit” of walking 40 or more miles in a day, which translates, minimally, into 10 to 14 hours of hiking. Even the young Wordsworth, an exceptionally strong walker, covered 20-25 miles per day on his Tintern Abbey tour (Hayden 78). Tatham probably exaggerates the length, if not also the frequency, of Blake’s hikes, exaggerating perhaps not as much as in the deathbed scene but for the same reason, to present Blake as transcending normal physical as well as mental limitations. Tatham’s implication that Blake had discontinued long walks late in his life is clearly refuted by Blake’s trips to Hampstead. So is his implication that Blake “remained in the House, so long that [it] was considered far from extraordinary his days were shortened.” Tatham clearly places Blake’s housebound period close to his death, which suggests that he may have wanted to hide the fact that Blake regularly visited Linnell, from whom Tatham was estranged. Smith is presumably referring to the same period in Blake’s life, though he does not date it, when he states: “so steadfastly attentive was he to his beloved tasks, that for the space of two years he had never once been out of his house; and his application was often so incessant, that in the middle of the night, he would, after thinking deeply upon a particular subject, leap from his bed and write for two hours or more” (BR 475). The idea of Blake staying indoors for two years is, as Bentley notes, an unconfirmed “extraordinary story,” which, if true, may have occurred in “1813-14, when almost nothing is known about Blake” (BR 475n2). But it seems more plausible that Smith is alluding to the same period that Tatham describes. Smith’s description of Blake’s writing process echoes Blake’s own version of it as told to Robinson, 18 February 1826 (BR 322), and this too suggests that he had old Blake in mind. If so, Smith uncharacteristically exaggerated, or perhaps merely misunderstood Mrs. Blake’s summary of Blake’s last two years, when long walks to Hampstead were seriously curtailed but work was not. To a widowed care-taker and a biographer, perhaps Blake appeared housebound relative to his earlier peripatetic and social self. As causes of Blake’s illness, we can rule out the air of London’s northern villages and the combination of excessive work and lack of exercise. We cannot rule out Blake’s profession as an engraver, however, because of the theoretical connection between sclerosing cholangitis and copper intoxication. As noted, Blake confirmed his considerable exposure to copper, stating in 1809 that he had never, “during a Period of Forty Years . . . suspended his Labours on Copper for a single day” (E 568). This claim is somewhat hyperbolic, since Blake did not take up engraving until 1772 and appears to have had a hiatus in 1799 (E 704). But given that some of the Jerusalem plates may be as late as c. 1820 and that the 22 plates of the Book of Job, the Laocoön, and the seven incomplete Dante engravings were executed between 1823 and 1827, it is no exaggeration to say that Blake was exposed to copper for 55 of his 69 years. But surely, other engravers were exposed to copper for extensive begin page 46 | ↑ back to top periods as well. In the absence of epidemiological studies on nineteenth-century engravers and data on their livers and deaths, is this theoretical connection worth pursuing? We believe it is, because it will provide the grounds for further research on Blake’s death and because it will illuminate where and how Blake differed from his fellow engravers.17↤ 17 It is controversial whether chronic copper intoxication can cause or aggravate sclerosing cholangitis. Although a recent review does not mention the role of copper in the pathogenesis of sclerosing cholangitis, there are numerous reports of excess copper in the livers of patients with this disease and several authors who speculate that excess copper might at least aggravate the condition. To our knowledge, there is no data to prove or disprove the possible role of copper in sclerosing cholangitis. There is data to support the role of chronic copper ingestion as the cause of Indian Childhood Cirrhosis, a cause of liver failure in Indian children believed to be acquired by drinking water from inadequately tinned copper vessels. Cirrhosis develops in patients with Vineyard Sprayer’s Disease, which is considered to be due to the inhalation of copper salts in fungicides. There are several animal models of liver failure that develop due to chronic exposure to copper, including sheep and Bedlington Terriers. There are numerous reports of acute copper intoxication due to the inhalation of copper. Metal fume fever is caused by the inhalation of copper by welders and presents itself with fever, chills, nausea, vomiting, cough, muscular pain, headache, weakness, and a metallic taste. The symptoms usually abate in 24 to 72 hours (Armstrong). An early report describes Brass Founder’s Ague, using the same terminology Blake used to describe his “old symptoms” or “original complaint” (Burstein). On 4 August 1772, at 14 years of age, Blake began his seven year apprenticeship to the engraver James Basire (BR 9).18↤ 18 For information about Blake’s apprenticeship and the techniques of engraving, etching, and relief etching, see Essick, William Blake, Printmaker (3-38) and Viscomi, Blake chaps. 1-15. Like all others of his craft, he learned all the stages of engraving and, because during this period original and reproductive engravings began as etchings, executed in a technique known as “mixed-method,” Blake learned all the steps of etching as well. 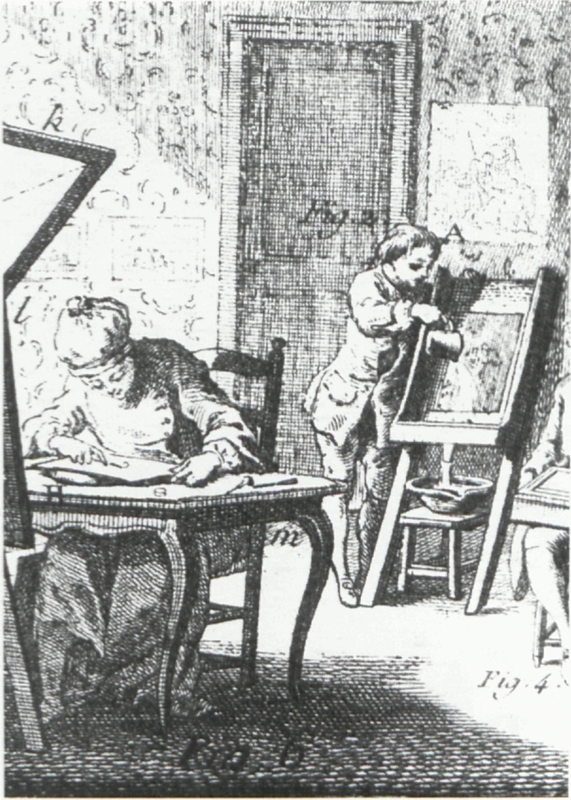 He learned to draw for the printmakers, to cut plates out of sheets of copper, prepare the plates to accept etching grounds, to transfer drawings onto plates, to make inks and stop-out varnishes, to use and sharpen diversely shaped burins and needles, to prepare paper for printing, and to use a rolling press. And he learned how to mix, dilute, and use nitric acid. By the time he invented relief-etching in 1788, he had over 16 years of experience in engraving and etching. This means 16 years of handling copper and being exposed to the fumes from the chemical reaction of nitric acid and copper. Other engravers were exposed to these fumes as well, and in normal etching—if done correctly—the fumes were weak. Their potential for harm, however, increased substantially with relief etching. In standard practice, the hand-hammered copper plate is prepared for engraving by being first planed to a smooth surface with water and charcoal, pumice stones, and metal burnishers. It is then polished with a tightly rolled piece of felt using oil as the lubricant. The plate is then cleaned of oily residue by being thoroughly rubbed with whiting or breadcrumbs mixed with water. The “degreased” plate can now accept an etching ground, an acid-resistent mixture of wax and resins melted onto the plate and spread into a thin film. The design’s outline is transferred onto this covering ground and then scratched through with a needle. The metal beneath the ground is now exposed and can be etched with acid. The purpose of the etch is to place the lines lightly into the plate to facilitate the engraver’s burin. In the seventeenth-century, the ground was very hard and the acid was vinegar-based, and the needle used to cut lines had an oval tip that could cut lines that swelled like those cut with burins. 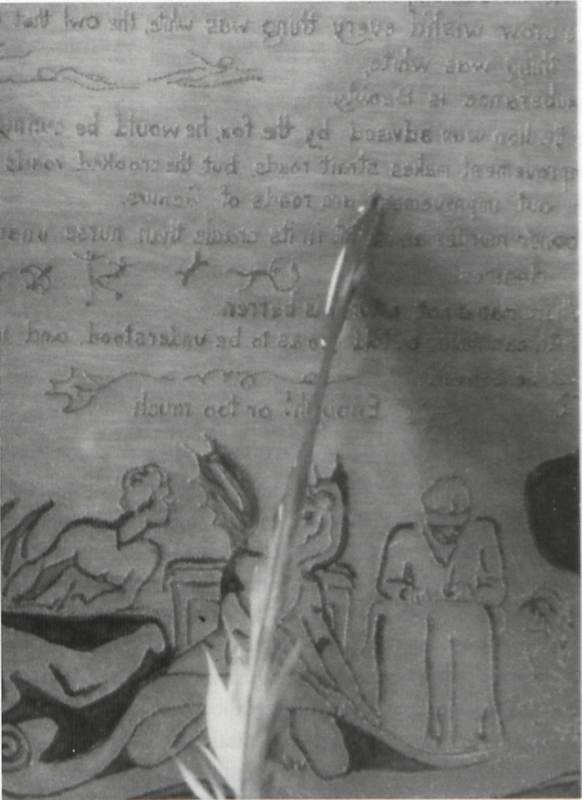 The plate was etched by being placed on an easel or trough and having acid poured over it (illus. 1). These materials and etching technique, however, were long out of fashion when Blake began to learn the trade. They were replaced with a softer, more supple ground and pointed etching needles, with true nitric acid, and with a new way of applying the acid. 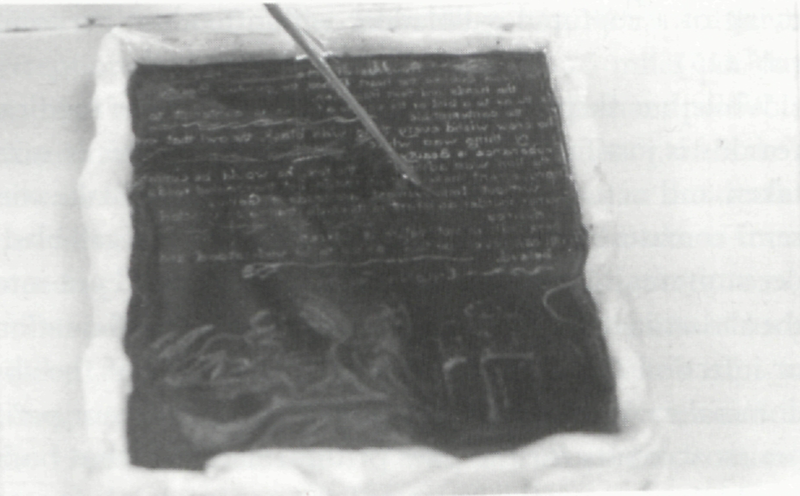 Plates were diked with wax to hold acid, which was poured on its surface (illus. 2). This new method required that the plate be watched carefully while being etched, because nitric acid cuts laterally as well as vertically, which means that it can cut under lines and thereby ruin fine line work or hatching. Nitric acid can also ruin the design by coarsening[e] lines or pitting or lifting (“foulbiting”) parts of the etching ground. To prevent these effects, an etcher or assistant passed a feather over the design to release the gas bubbles or “the froth or scum, which gather upon . . . strokes of hatchings whilst the water performs its operation” (Sculptura 91; Faithorne 35). Even in pure etchings, like caricature prints or aquatints, the amount of copper exposed to nitric acid was relatively minimal (illus. 3, 4), and the acid was diluted at least three to one and carefully regulated. 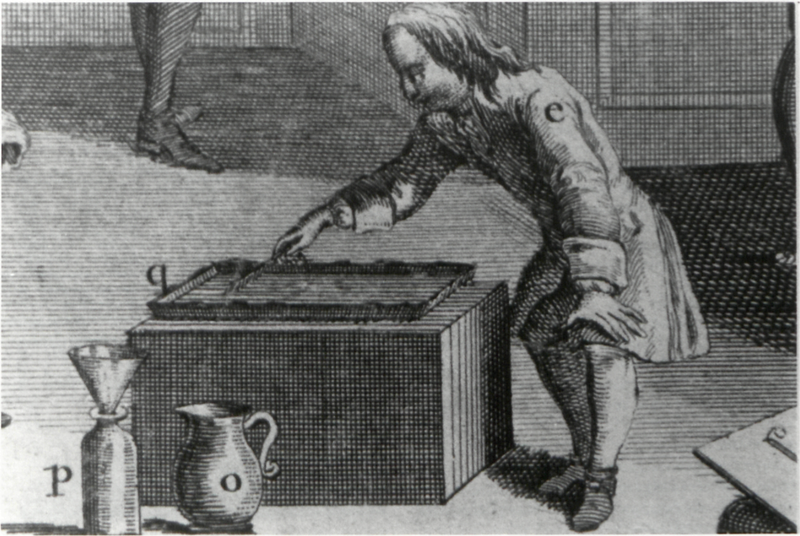 Depending on the acid’s strength and the etcher’s objective, the plate would have remained in the acid continuously for 15 to 40 minutes. Like his contemporaries, Blake would have been exposed to copper particles and dust that were released into the air by cutting plates from sheets and from preparing plates by planing, burnishing, and polishing. These amounts, like those from etching plates in the normal manner, were probably negligible. 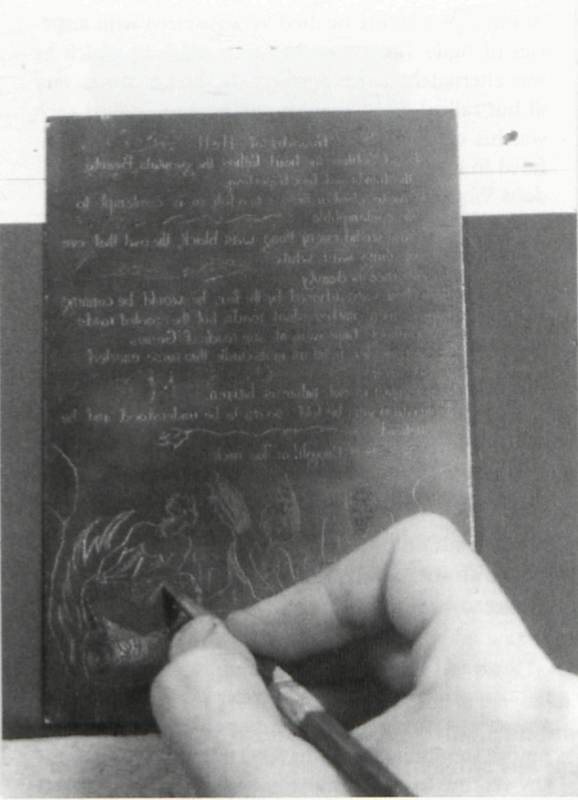 Blake’s exposure to copper dust and fumes, however, as well as to nitric oxide and dioxide, increased enormously when he etched plates in relief. Blake’s technique required a stronger acid and a much longer bite, upwards of eight hours or more, while still requiring a fairly constant check. Furthermore, because only the lines of the design are covered in an acid-resistant ground, the amount of copper exposed to the acid was many times that of normal etching (illus. 5, 6). The more metal acid bites, the hotter and more active it becomes and thus the greater the chance of foulbiting. Blake’s “corrosives,” or “corroding fire,” lay on the walled-in plate about “half a finger’s breadth all over” (Faithorne 33), turned blue, and bubbled along begin page 47 | ↑ back to top the relief lines. This kind of active bite would have prevented the plate “from being seen” (Dossie 2: 166). Given the amount of metal exposed, the bite must have been very active, probably enough to have become cloudy and emitted much higher than usual amounts of nitric oxide and dioxide, “which in hell” may be “salutary and medicinal,” but on earth are potentially hazardous. Blake may be alluding to such fiery biting when he asserts that “melting apparent surfaces away, and displaying the infinite which was hid” characterized “printing in the infernal method” (E 39). To prevent his plates from being pockmarked by the strong acid, Blake may have added sal ammoniac to his nitric, which “has the peculiar property of causing the aquafortis to bite more directly downwards and less laterally” (Fielding 212). Nitric diluted with sulphuric acid (“oil of vitriol”) 10 parts to one, and then five parts water to two parts acid, makes “an aquafortis that will consume the copper more keenly and cleanly than a purer spirit of nitre, without leaving any roughness or frosted appearance in the lines” (Dossie 2: 150). But none of these additives eliminates the need to feather the plate while it is being etched. Blake appears to allude to feathering plates in the “Printing house in Hell,” where this stage—and, metonymically, etching—occurs in the third chamber: “Eagles with wings and feathers of air . . . caused the inside of the cave to be infinite” (E 40). But a constant watch and careful feathering could also have been disadvantageous to Blake’s health, for it meant inhaling noxious fumes for hours at a time (illus. 2). That Blake singled out the etching stage of his new technique in The Marriage of Heaven and Hell suggests that he knew he was working without precedent. He certainly was working in homes with poor ventilation (see illustrations in BR 560 and 562, and Keynes plate 23). His plates required a new kind of etch, which Blake could have perfected only through trial and error, learning “what is enough” by knowing “what is more than enough” (Marriage plate 9). Blake’s “infernal method” assured excessive exposure to the noxious fumes produced by the chemical reaction between nitric acid and copper. This exposure was not continuous, but it was intense for brief periods; hence, supposing that it may have weakened his immune system and contributed to his IBD seems reasonable.19↤ 19 We hope to supplement the current study with data drawn from testing air samples from the various stages in the etching and relief etching processes for copper dust and fumes and nitric oxide and dioxide. We intend to compare these samples with those established by environmental agencies like EPA and thereby refute or confirm scientifically our supposition that Blake inhaled dangerous amounts of copper dust and fumes and nitric dioxide. Table: Blake’s symptoms and the various diseases to which they are related. three or four separate plates for a total of about 100 plates.20↤ 20 The separate plates include The Approach of Doom and possibly Joseph Preaching to the Inhabitants of Britain (both c. 1788); “The Divine Image” and possibly “To Tirzah” both c. 1790 (Viscomi, “Evolution” n17). After a two-year hiatus, Blake executed Visions of the Daughters of Albion, America, a Prophecy, Europe, a Prophecy, The Book of Urizen, and The Song of Los between 1793 and 1795 for a total of 84 mostly large plates.21↤ 21 This number includes the four rejected plates of America but counts Song of Los as six instead of eight plates, because its plates 3 and 4 were the left and right sides of an uncut oblong folio-size plate, as were plates 6 and 7 (Viscomi, Blake 414n25). Blake appears to have etched plates in batches; he did not have to wait till all the plates of a book were executed, nor did he need to etch one plate at a time as soon as it was executed (Viscomi, “Evolution,” forthcoming). Etching plates in groups greatly increased Blake’s exposure to the copper and noxious fumes released by a strong and long etch. During the first period of illuminated book production Blake was 31-33 years old, and during the second he was 36-38. Is this, the Blake of the late 1780s and early 1790s, the “young” Blake who regularly experienced “the same Complaint & the same torment of the Stomach” as the 68-year-old man reflecting on 1 February 1826? Perhaps to an old man it is, and Tatham’s account of Blake’s long walks with his wife supports that hypthosis. There is no documentary evidence to prove it, though. Neither of the two personal letters extant before 1797 (E 699-700) mentions his health, and Blake claims on 11 December 1805 that he “was alive & in health & with the same Talents” in the 1790s, “the time of Boydell’s Macklins Boyers & other Great Works” (E 766-67). On the other hand, “in health” must be read in light of his saying that his “Constitution” was “a good one” despite its having “many peculiarities,” like stomach cramps, that no one” but himself could know (E 775). Blake may have experienced episodes of acute copper intoxication after intense periods of etching, and some of Blake’s symptoms—“the same Complaint & the same torment of the Stomach” that laid him up “the day after & sometimes [for] two or three days”—could fit with the delayed effects of acute copper intoxication (see n17). It is tempting to speculate that Blake’s walks to the villages north of London were prompted by his need for fresh air after etching plates in strong acid all day long for a week or more. It is tempting because the symptoms of acute copper intoxication include nausea, vomiting, abdominal pain, diarrhea, blood in the urine, and jaundice. Some of the symptoms (nausea, vomiting, abdominal pain) develop in the first day, but others develop after one (diarrhea, blood in the urine) or even several days (jaundice). Blake took a long rest before etching relief plates again. The next two projects, Milton and Jerusalem, contain between them 50 mid-size and 100 large plates, but they were done over a number of years. Both are dated 1804, but the former was probably not finished until c. 1811 and the latter not until c. 1820 (Viscomi, Blake chap. 32, 34). Cumberland, however, reported in the summer of 1807 that Blake had “engd 60 Plates of a new Prophecy!” (BR 187). Is he referring to Jerusalem or a mixture of the two books? Apparently, Blake had etched at least 60 plates of one or both works in three years, which would have been a period of etching as sustained as the previous two. After that, he appears not to have been in any hurry to finish Jerusalem. The relatively vast amounts of copper exposed to acid in illuminated plates differentiates Blake’s technique from all others and subjected Blake to more noxious fumes than any of his contemporary printmakers. Another difference between Blake and other engravers is his late engraving style. The 22 plates to Job and the seven Dante plates are pure engravings, which means that Blake worked directly into the metal without the aid of preliminary etching. The Job plates, contracted in March 1823 and finished in March 1826 (BR 277, 327), are all extensively engraved, providing Blake with his most extended and sustained exposure to copper in his last years and probably in more than a dozen years. Is it mere coincidence that Blake’s health began to decline while he was engraving them? Could they have exacerbated the illness that had lain dormant[e] for years? Or were the Job and Dante engravings executed as pure engravings, without preliminary etching, because Blake had made a connection between the noxious fumes and his “old symptoms”? Was the choice of technique, in other words, determined by Blake’s desire to avoid etching or to emulate the style of the “ancient” engravers whom he was then re-examining with Linnell?22↤ 22 Essick has argued in William Blake, Printmaker that Blake’s late style of pure engraving was influenced by his and Linnell’s study of early Italian and German engravings (219 passim). In private correspondence, he raises the possibility of the choice being driven by health. On 27 January 1804, Blake predicted to William Hayley that “if God blesses me with health [I] doubt not yet to make a Figure in the Great Dance of Life that shall amuse the Spectators in the Sky” (E 741). That he has done, and would have even if all he produced were those “stupendous Works” of his last years, when his health had significantly declined. The available evidence suggests that Blake might have had IBD, a condition that commonly precedes sclerosing cholangitis, and that he probably died from biliary cirrhosis caused by sclerosing cholangitis. Chronic copper intoxication is a theoretical cause or aggravating factor in the pathogenesis of sclerosing cholangitis, raising the possibility that Blake died due to a disease acquired during his years of relief-etching. Anon. “Case Reports at St. Thomas Hospital,” Lancet 11(1826): 534-??. Armstrong, C. W. et al. “An Outbreak of Metal Fume Fever.” Journal of Occupational Medicine 25 (1983): 886-88. Bentley, G. E. Jr. Blake Records. Oxford: Oxford University Press, 1969. Burstein, A. “Brassfounders’ Ague.” Journal of Industrial Hygiene 7 (1925): 110. Clutterbuck, Henry. “Of Complicated Fever.” Lancet 11 (1826): 756. —. “Periodical Fever.” Lancet 11 (1826): 760. Dossie, Robert. The Handmaid to the Arts. 2nd ed. 2 vols. London, 1764. Elliotson, John. “Ague.” Lancet 12 (1827): 140-141. Erdman, David V., ed. The Complete Poetry and Prose of William Blake. New York: Doubleday, 1988. Essick, Robert N. William Blake, Printmaker. Princeton: Princeton University Press, 1980. Essick, Robert N. and Joseph Viscomi, eds. Milton, a Poem and the Last Illuminated Works. Princeton: Princeton University Press, 1993. Faithorne, William. The Art of Graveing and Etching. 2nd ed. London, 1702. Fielding, T. H. The Art of Etching. London, 1844. Gilchrist, Alexander. Life of William Blake. London: MacMillan, 1863. Gross, John B., et al. “Abnormalities in Tests of Copper Metabolism in Primary Sclerosing Cholangitis.” Gastroenterology 89 (1985): 272-78. Hayden, Donald E. Wordsworth’s Travels in Wales and Ireland. Tulsa, Oklahoma: University of Tulsa Press, 1985. Jamison, Kay R. Touched by Fire: Manic-Depressive Illnessbegin page 49 | ↑ back to topand the Artistic Temperament. New York: Free Press, 1993. Keynes, Geoffrey, ed. The Letters of William Blake. Oxford: Oxford University Press, 1980. LaRusso, Nicholas F., et al. “Primary Sclerosing Cholangitis.” New England Journal of Medicine 310 (1984): 899-903. London and Provincial Medical Directory. London, 1861. Medical Times & Gazette, Obituary for Dr. James Forbes Young, 14 July 1860, 46. Schiff, L. and E. R. Schiff. Diseases of the Liver. 6th ed. Philadelphia: J. B. Lippincott, 1987. Sculptura Historico-Technica: or the History and Art of Engraving. 4th ed. London, 1770. Sherlock, S., and J. Dooley, eds. Diseases of the Liver and Biliary System. Oxford: Blackwell Scientific Productions, 1993. Shorter, R. G. “Sclerosing Cholangitis.” Inflammatory Bowel Disease. 3rd ed. Philadelphia: Lea & Febiger, 1988. Smith, J. T. Nollekens and his Times. 2 vols. London: Henry Colburn, 1828. Essay on Blake in 2: 454-88; rpt. in Bentley, Blake Records, 455-76. Tatham, Frederick. Life of Blake (MS), c. 1832. Rpt. in Bentley, Blake Records, 507-36. Viscomi, Joseph. Blake and the Idea of the Book. Princeton: Princeton University Press, 1993. —. “The Evolution of William Blake’s The Marriage of Heaven and Hell.” Huntington Library Quarterly (forthcoming). —. “A ‘Green House’ for Blake? New Information on Thomas Butts, His Residences, and Family.” Blake 30 (1996): 4-21. Ward, Aileen. “William Blake and the Hagiographers.” Biography and Source Studies. Ed. by Frederick R. Karl. New York: AMS Press, 1994. Weisner, Russell H, and Nicholas F. LaRusso. “Clinicopathologic Features of the Syndrome of Primary Sclerosing Cholangitis.” Gastroenterology 79 (1980): 200-06. Wells, David. A Study of William Blake’s Letters. Tübingen, Germany:[e] Stauffenburg Verlag, 1987. Wilson, Mona. The Life of William Blake. London: Rupert Hart-Davis, 1948. Wyngaarden, James B, Lloyd H. Smith, and J. Claude Bennett, eds. Cecil Textbook of Medicine. 19th ed. Philadelphia: W. B. Saunders Co., 1992.